The Seahawks paid tribute to their former teammate Richard Sherman in his return to CenturyLink Field. Then, they showed the NFL that they are much more than a 'middle of the road' team. 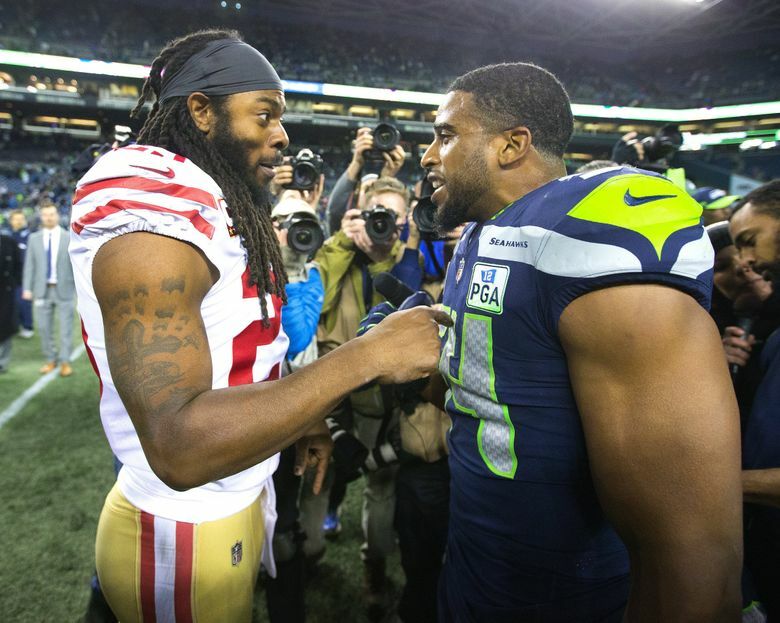 The Seahawks were respectful, if not reverential, in their interactions with Richard Sherman before, during and after Sunday’s game with the 49ers. 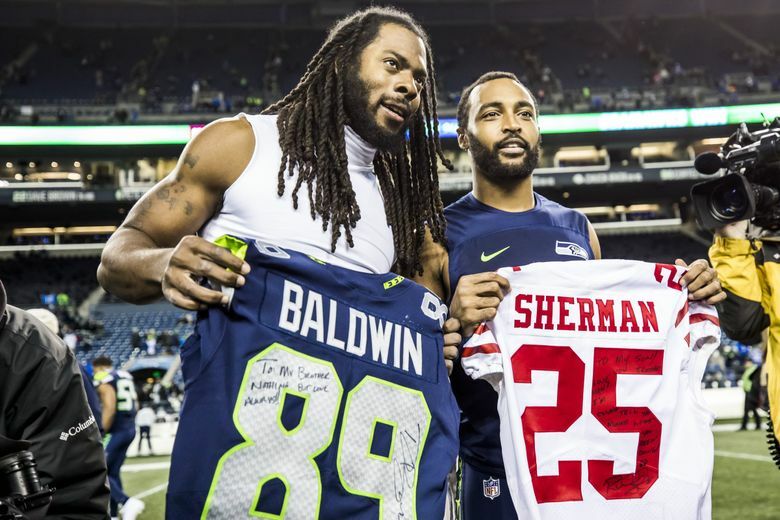 But the Seahawks, by virtue of their dominance in a 43-16 victory over San Francisco, conveyed a message to Sherman that was undeniable: This is no “middle of the road” team. 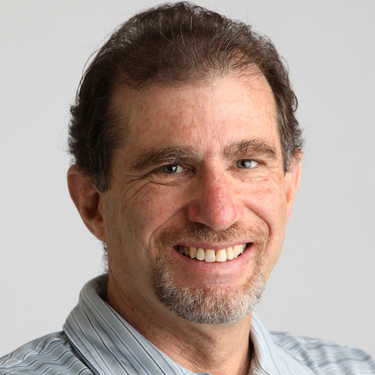 That was Sherman’s biting appraisal of the Seahawks in a news conference Thursday – the same session in which the 49ers cornerback noted dismissively that he’s seen Russell Wilson throw five picks. Wilson had no picks Sunday – and four touchdown passes out of 11 completions, a hearty 36 percent. Richard Sherman had a quiet return to Seattle. Here's what he said afterward. Not that the Seahawks were gloating to Sherman in any fashion whatsoever, mind you. There was just some good-natured teasing from Bobby Wagner, he of the 98-yard interception return, who was asked about the animated conversation he had with Sherman after the game. The fact is that the Seahawks, far from middle of the road, are looking increasingly like not just a playoff team, but one that is getting stronger by the week. A franchise known for its December surges is hoping it is on the verge of another one. “I love the way it’s fitting together for us,’’ said coach Pete Carroll. The calculated reserve by Carroll is reminiscent of the mindset that has served this team well in the past: that nothing is accomplished until everything is accomplished. But by winning three in a row, by avoiding a letdown against a downtrodden team with just two victories, by once again perfecting a run-first offense peppered with high-impact passes, and by forcing two huge turnovers while having none of their own, the Seahawks played like a team set up for a strong playoff run. “We’re putting together the right formula for us to make a push now,’’ Carroll said. The football gods seem to be smiling on Seattle as well. Virtually every outcome in recent weeks has played in the Seahawks’ favor, including defeats on Sunday by Minnesota (their next opponent), Chicago, Carolina and Green Bay. The Seahawks now hold possession of the No. 5 playoff berth, with three of their final four games at home. 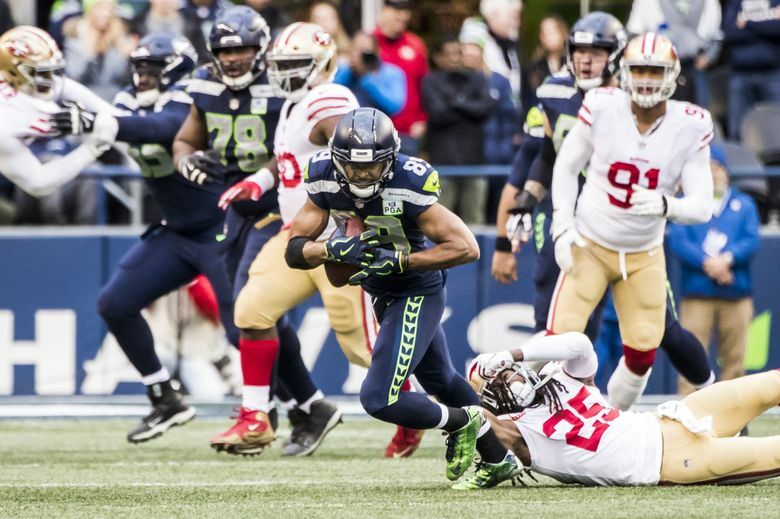 It was not lost upon the Seahawks that they allowed the 49ers to accumulate 452 total yards (414 by quarterback Nick Mullens) – but with the game never in doubt, they seemed like empty yards to a large extent. Clark, in fact, indicated that the team is on a crusade to keep complacency from settling in. “Guys get comfortable with winning, they get the hype around them and they get sucked into it,’’ he said. “I feel that’s one thing we have to keep our head down about. We can’t look too deep into the articles, because they talk good about you when you’re winning. They speak all the good things, and sometimes that goes to guys’ heads. It was a very good sign that the Seahawks’ wide receivers produced so many touchdowns that they had to scramble to come up with a choreographed celebration for No. 4. That explains why David Moore could be seen hastily running through “The Macarena” on the sideline. “We were trying to figure out what other celebrations we had so we could do it next time we scored,’’ Moore said. Those are hardly the issues of a middle-of-the-road team, one that is starting to truly believe that a December run is brewing.